UPDATE: Google has killed off their igoogle widget program so this is no longer available. On Bainbridge Island we are surrounded by the Puget Sound so the tides are a daily part of our lives. The kids want to know when they can dig for horse clams, Rockaway Beach is only accessible at low tides and jumping off Point White Pier is better at high tide. If you have questions about the gadget just e-mail & ask him (cpsandbox@gmail.com). December proved to be a wild month for weather here on the island. If you live here, you already know this. 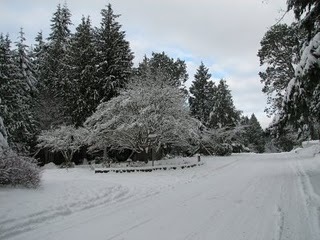 If you are reading my blog from afar, know that Bainbridge does not usually get snow like this. But, since the rest of the country had crazy weather this winter, we thought we would too. Snowfall of a foot plus occurs once every ten years here, so they say. But, on an island, in a small community, the snow did some interesting things for Bainbridge. For one, the snow fell and stayed for a while. Here, we are not prepared like they are in say, Colorado, for example. The snow plows are not stacked up in the city maintenance yard. So, many folks were homebound for four or five days. Schools shut down, the ferries were sparce. The snow gave families some extra hunker-down time. Families walked to the nearest hill and sledded for as long as they could stand the cold. Luckily we had advance warning for all of this and folks stocked up on goods. Which leads me to the second thing the snow did for Bainbridge, it helped the local merchants. Many people did not want to or could not leave Bainbridge because of the weather. So, days before Christmas, downtown Winslow was bustling, snow and all, power, or not. The downtown area got a much needed end-of-the-year boost. The merchants were busy . . . many ran generators and were open when the power was off. I was happy to see a very busy downtown scene at the end of a challenging economic year. So, as the snow melts, life, as we know it here, is resuming. Folks are heading back to work, the chains are off – I now remember what my yard looks like. 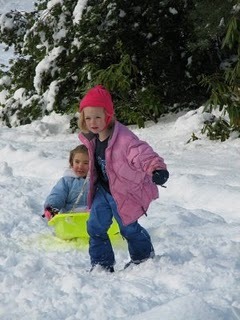 But, the kids, of course loved the snow, and I know mine are ready for the next round of snow – and sledding.